The gold stocks have been on a tear lately as they continue to move higher in defiance of the bearish calls of numerous pundits and traders. After trading lower mid week and filling Monday's gap, the miners are set to close the week with some strength. While the miners are overbought and could remain below resistance for a little while, their strong outperformance of Gold remains a comforting signal for bulls. The selloff in the miners began once they hit their first resistance targets, as noted in our editorial from last week. We noted immediate upside targets of GDXJ $33 and GDX $22.50. To be exact, GDXJ hit $33.07 and GDX touched $23.06. The resistance lines are visible in both charts below. 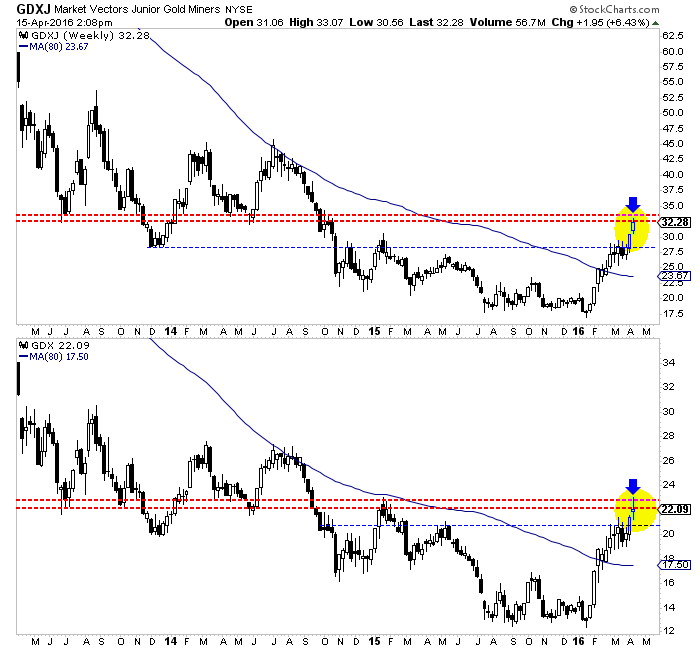 Because the miners remain a good distance above their 50-day moving averages (GDX $19.58, GDXJ $26.82) it is possible they consolidate beneath resistance for a few weeks. Turning to the metals, Gold continues to consolidate as it works off the excess speculative positions while Silver has broken out and above its 80-week moving average for the first time since late 2012. Both metals will close the week higher than depicted in this chart. Other than Gold's consolidation and resemblance of a small distribution pattern, the precious metals complex looks quite healthy. The breakout in Silver was telegraphed by the strength in the silver stocks as SIL doubled from its lows and SILJ is up more than 150% from its lows. 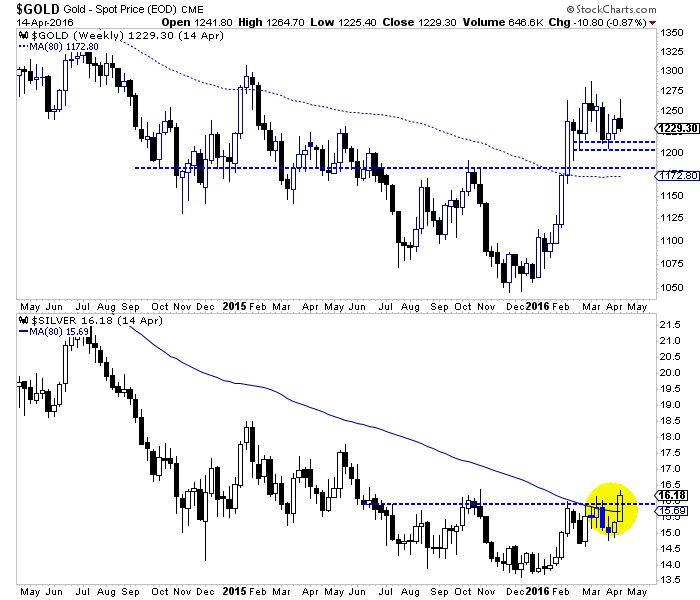 At the same time, the gold stocks, as already noted have shown the same kind of strength against Gold. Those who are focusing on Gold's CoT and false topping pattern are neglecting the more powerful signals given by the rest of the sector. Because the gold stocks are at resistance and remain well above their 50-day moving averages, it is possible they could correct and consolidate for a few weeks before moving towards higher targets. We want to reiterate that the relative strength in the gold stocks and the relative strength in the silver space are healthy signs for the sector. If the sector were about to plunge (as some expect) Gold would be the leader and not the laggard that is now. Consider learning more about our premium service including our favorite junior miners which we expect to outperform in 2016.